Animals face different threats; to survive, they have to anticipate how to react or how to avoid these. It has already been shown in teleosts that selected regions in the telencephalon, i.e., the medial pallium, are involved in avoidance learning strategies. No such study exists for any chondrichthyan. In nature, an avoidance reaction may vary, ranging from a ‘freeze’ reaction to a startling response and quick escape. This study investigated whether elasmobranchs (Chiloscyllium griseum and C. punctatum) can be conditioned in an aversive classical conditioning paradigm. Upon successful conditioning, the dorsal, medial and lateral pallium were removed (group 1) and performance tested again. In a second group, the same operation was performed prior to training. While conditioning was successful in individuals of both groups, no escape responses were observed. 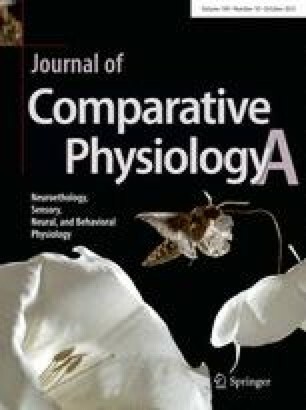 Post-operative performance was assessed and compared between individual and groups to reveal if the neural substrates governing avoidance behavior or tasks learned in a classical conditioning paradigm are located within the telencephalon, as has been shown for teleosts such as goldfish. We would like to thank M. Hofmann for technical support and helpful comments on the experimental setup. The research reported herein was performed under the guidelines established by the current German animal protection law (Landesamt für Natur, Umwelt und Verbraucherschutz NRW, 8.87-50.10.37.09.198).